On May 10, 1900, an enthusiastic Brooklyn crowd bid farewell to the Quito. The ship sailed for famine-stricken Bombay, carrying both tangible relief--thousands of tons of corn and seeds--and "a tender message of love and sympathy from God's children on this side of the globe to those on the other." The Quito may never have gotten under way without support from the era's most influential religious newspaper, the Christian Herald, which urged its American readers to alleviate poverty and suffering abroad and at home. 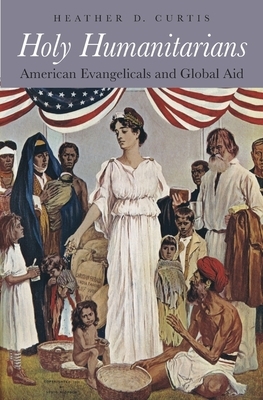 In Holy Humanitarians, Heather D. Curtis argues that evangelical media campaigns transformed how Americans responded to domestic crises and foreign disasters during a pivotal period for the nation. Through graphic reporting and the emerging medium of photography, evangelical publishers fostered a tremendously popular movement of faith-based aid that rivaled the achievements of competing agencies like the American Red Cross. By maintaining that the United States was divinely ordained to help the world's oppressed and needy, the Christian Herald linked humanitarian assistance with American nationalism at a time when the country was stepping onto the global stage. Social reform, missionary activity, disaster relief, and economic and military expansion could all be understood as integral features of Christian charity. Drawing on rigorous archival research, Curtis lays bare the theological motivations, social forces, cultural assumptions, business calculations, and political dynamics that shaped America's ambivalent embrace of evangelical philanthropy. In the process she uncovers the seeds of today's heated debates over the politics of poverty relief and international aid.